The past four years Andrew and I have planted a traditional style vegetable garden. Long rows of vegetables marked with wooden stakes. We have tons of space outside so the idea of having a huge chunk of lawn taken up by a garden wasn’t a concern. The row garden reminds me of my grandparents who planted a huge garden year after year, even when it made way more produce than two or one person needed. I remember sitting on the concrete step at the back of their house looking over the garden, watching them work, and hiding in the shade of the house from the hot sun. My parents also planted a row garden for years which I remember helping plant throughout my childhood and youth. There’s nothing inherently wrong with a row garden. It’s based on the straight lines and style of growing used by larger scale farmers and has been used by countless families for years. Andrew and I have routinely been excited about planting our garden in the Spring and I love to see the veggies grow throughout the summer. But inevitably we get busy, weeds flourish and the garden becomes neglected. Maintaining a row garden takes a lot of time and effort. This year we decided to try something different. Inspired by a book I got out of the library we have planted a couple of 4×4 square foot gardens. We are still planting some potatoes, squash, pumpkins, and zucchini in the old garden. But everything else has been planted in the new square foot gardens. These compact beds are supposed to make gardening more manageable and challenges the idea that row gardening is the only way to plant veggies. 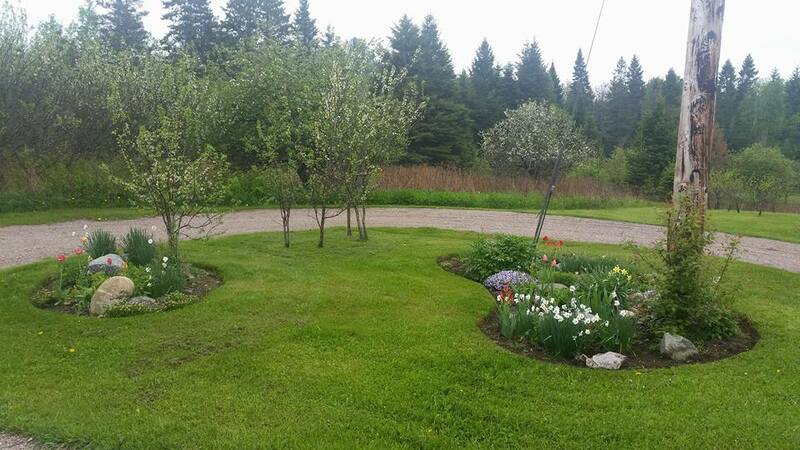 Andrew made the square foot gardens out of trees from our property and we planted the gardens together. The planting took way less time and considerably less physical toil than the large row garden. The ease of planting has me already loving the process and I hope the upkeep and yield are as rewarding. I’ll keep you posted on our progress. For Christmas I gave Andrew a membership to a beer of the (every other) month club. Since January we have been enjoying the bi-monthly surprise of craft beers delivered to our door. This month’s selection included two beers from Black Creek Brewery. Located at the Black Creek Pioneer Village heritage site the Black Creek Historic Brewery opened in 2009 and employs the techniques, tools and recipes used by Ontario brewers in 1860s. In the 1860s there were 155 registered breweries in Ontario.Black Creek Historic Brewery is the first to recreate the brewing processes of this era. Each batch is created entirely by hand, uses no electricity, and much of the equipment is made from wood and cooper. The beer ferments in wooden casks, barley is shoveled by hand, and filtration is done in the ‘old style’ using barley husks. For those interested in learning more about brewing in the 1860s you can visit the Brewery as part of the Pioneer Village and they run a program where you can ‘brew with the brewmaster‘ for a day. A visit to the Brewery is an added cost ($4.50) to admission to the Pioneer Village and includes tours of the hop garden, cooperage, mill, brewery, and beer samples. For those living further afield the Brewery maintains a blog, The Black Creek Growler, which is filled with interesting historical and beer related facts. The two Black Creek selections we received from were ‘Brilliant’ and ‘Marzen’. What struck me most about Brilliant was the cloudy nature of it. The old style filtration process means that the beer is almost akin to unfiltered beer and has a dense slightly opaque look. 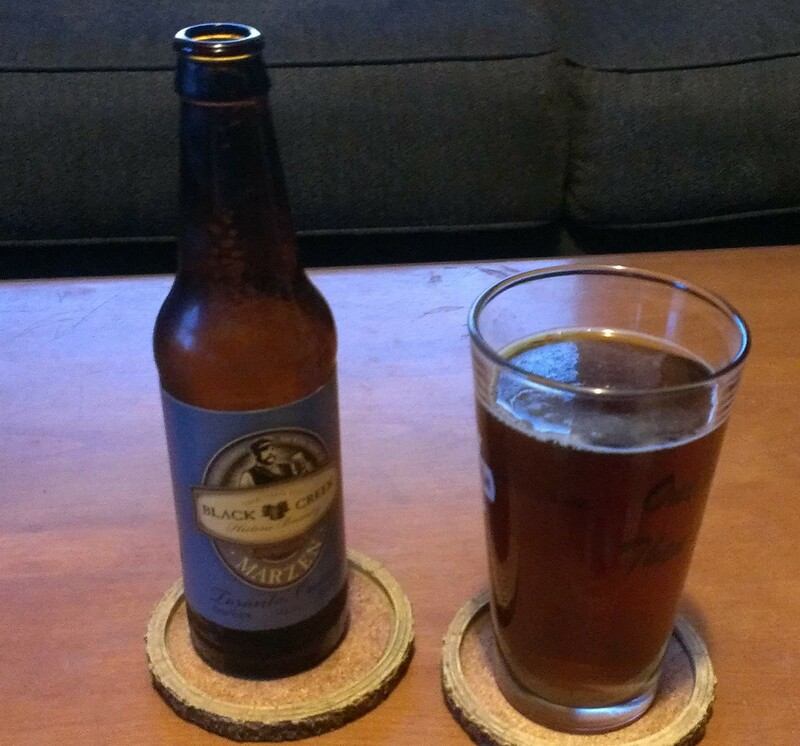 As far as taste goes the Brilliant was light, kind of sweet, and fairly smooth drinking. In contrast Marzen was red in colour, had a fruity smell, and a delightful hoppy malt taste. The Marzen falls under the brown ale category of beer that would have been brewed in the 1860s. It was a neat experience to try ‘historically brewed’ beers that were made on a historic site. I love the idea of perennial vegetables. You plant them once and are rewarded with food year after year. Perhaps the most well known perennial vegetable is rhubarb. It grows in abundance, requires minimal maintenance, is almost impossible to kill, and can be made into a multitude of tasty treats. We were lucky that Oslicken Acres came with three well established patches of rhubarb when we moved in. The one patch had a trailer parked on it temporarily and it is still thriving. From this year’s harvest I’ve made rhubarb desert and rhubarb cake. I’m hoping to try a rhubarb nut loaf in the next week or two. Last year we started to plant additional perennial vegetables and created our own bed of asparagus. I had no idea asparagus was a perennial plant until a friend mentioned it. It was great to see the spears of asparagus poke out of the ground this year – and a relief that they survived the winter. Since this is only the bed’s second year we haven’t been able to eat any of the tasty morsels yet but are anxiously looking forward to when the bed is mature enough to harvest. After doing some reading I’m hoping to plant some wild leeks in the future – another tasty perennial treat that requires little upkeep. Spring has sprung on Oslicken Acres. The flowerbeds we created last year are thriving and many of the bulbs we planted in the fall have come up. The emergence of tulips and daffodils in the spring are always heartening after a long winter. Krista and I decided it was time for a blog to replace our wedding site. Couldn’t get rid of it completely though – you can still view it here. More posts coming soon – maybe – we think!